“How do I make Google home play a spotify playlist? – How for the love of whatever you all hold holy get Google home to play one of my playlists??? I say “ok google play my music playlist on spotify” to which I normally get “playing a radio station based on your music playlist” which is not what I want. I want it to play the playlist i’ve told it to play!! Is this really the most difficult thing in the word? How to play Spotify on google home?” asked by tBs-Battousai on Spotify Community. Questions like the above ones are not rare on Spotify Community and Google Home community. Many people have tried to link Spotify to Google Home speakers so as to play Spotify on Google Home. But various problems that blocked them from listing to Spotify playlist on Google Home might occur. Well, in this guide, we would like to introduce you detailed steps on how to play Spotify playlist on Google Home by either linking Spotify to Google Home speakers or downloading Spotify songs to Google Home. And the questions stated above will also be answered in Part 2. Developed by Google, Google Home is a brand of smart speakers that enable users to speak voice commands to interact with services through Google’s intelligent personal assistant called Google Assistant. 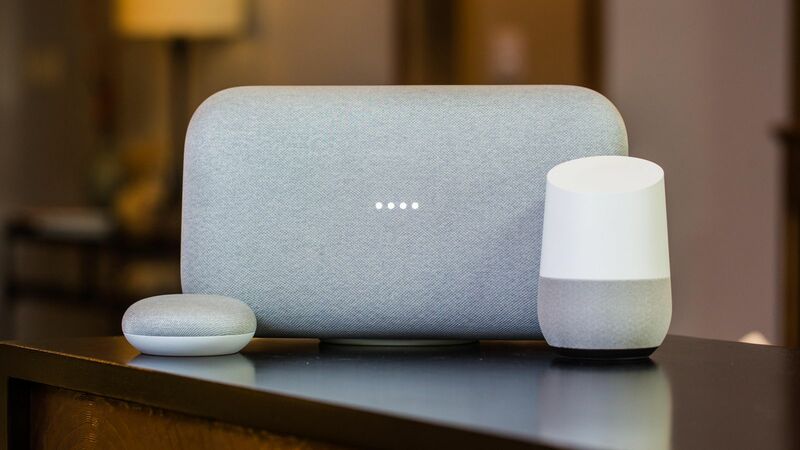 By integrating a large number of both in-house and third-party services, Google Home allows users to listen to music, control playback of videos or photos, or receive news updates entirely by voice. Users could place multiple Google Home devices in different rooms of a house for synchronized playback of music. 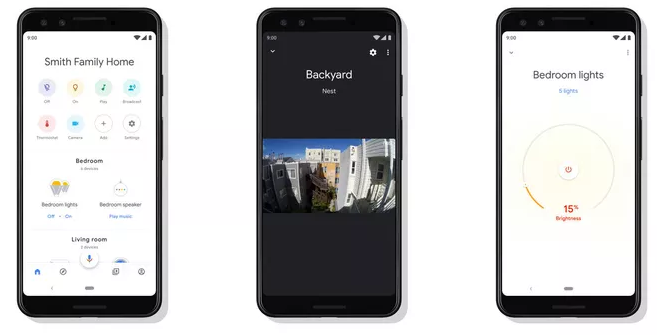 Google has developed multiple Home variants, including: Home, Home Mimi, Home Max, and Home Hub, whose internal hardware was very similar to that of Chromecast, with the same ARM processor and Wi-Fi chip. 1. Broadcast: Make one voice command to one Google Home device in any room and it will play on all connected smart speakers throughout your home. 2. Recipe assistance: You can learn how to cook from step-by-step instructions provided by Google Home, skipping forward and back as needed. 4. Multiple commands: Successively issue two commands to your Google Home for different operations. 5. Night mode: Set a time gap to let Google Home automatically lower the volume of its vocal responses and music streaming at certain times of the day for either launch break or nap. 6. Routines: Give a command such as “Good morning” or “I’m leaving” and you can customize your Google Home to respond in a variety of ways, including telling you about your commute, playing the news and controlling your compatible smart home devices. When we speak of Google Home, it’s inevitably to mention the Google Home app, which performs like the brain of Google Home smart speakers. The Google Home app helps you set up and control Chromecast (Chromecast, Chromecast Ultra, Chromecast Audio, TV or speaker with Chromecast built-in), Google Home devices, and Google Assistant speakers or Smart Displays. You can control thousands of compatible lights, cameras, speakers and more, all from a single app. Plus, you can discover popular music, TV shows and videos to cast to your TVs and speakers. 1. Set up Google Home devices mentioned above and Chromecast devices (Chromecast, Chromecast Ultra, Chromecast Audio, and TVs and speakers with Chromecast built-in). 2. Control, organize and manage compatible lights, cameras, TVs and more, all from just one place. The Google Home app works like a remote with thousands of smart home devices from most popular brands. 3. Manage your Google Assistant settings and preferences. 5. Browse TV shows, music, and movies. Google Home app will play an even more centralized role on your Google Home devices with Google Assistant reaching out to more hardware. You could do most settings on Google Home app to get a better digital entertainment life. Back to our main topic: how to link Spotify to Google Home and play Spotify on Google Home? Before I/O 2017, Google had been promising to make its Home line of speakers compatible with more music streaming services. And, after I/O 2017, it added support for Spotify Free (it already supported Spotify Premium). You could then link Spotify to Google Home to voice control your Spotify on Google Home. 1. Download the Google Home app and open it. 2. Tap the menu in the top-left corner. 3. Tap “Account preferences”, then “Linked media accounts”. 4. Select “Spotify” and tap “Link Account”, then Log in to Spotify. 5. Then, tap “OKAY” button to confirm. If you don’t have a Spotify account, just create one by clicking the “Sign up” button. When you have created a Spotify account, you will be asked to link Spotify to Google Home from the very beginning. 1. In the Google Home app, tap the menu in the top-left corner. 3. Select “Spotify” to set it as the default music player for your Google home. Some people, like tBs-Battousai who asked the questions in the beginning of this guide, might come across situations that Spotify on Google Home responds wrongly to the voice commands like playing songs that are not commanded by users. This is because you have to upgrade to Spotify Premium to let the Spotify on Google Home 100% obey your commands. If you don’t have a Spotify Premium account, you’ll hear a station of songs inspired by the song/album/artist or personal playlists you asked for. You can’t hear specific songs, albums, artists or personal playlists on demand, but you can ask for music based on genre, mood or activity, or for Spotify-curated playlists. As mentioned above, you could voice control Spotify playback on Google Home. The below are some useful Google Commands you could make use of for controlling Spotify music playback on Google Home speakers. "Play <song name>," "Play <song name> by <artist name>," "Play <song name> from <album name>," “Play <song name> on <music service>” "Play songs like <song-name>"
"Play <artist name>," "Play music by <artist name>," "Play <artist name>" on <music service>,” "Play songs like <artist-name>"
"Stop ", "Stop the music"
"Set volume to 5", "Set volume to 40%"
Play music on your speakers, TV, or video device. Note: Device linking is required. "Play music on my living room TV", "Play <genre> on my bedroom speakers"
These are the basic voice control commands you could use upon Google Home. For some advanced voice control commands, please refer to Google Support page. As mentioned above, you could link Spotify to Google Home to play Spotify playlist on Google Home. However, you have to upgrade to Spotify Premium to listen to the music on your demand instead of songs from station of songs inspired by the requested song. This will take you $9.99 per month. What if you don’t want to spend $9.99 per month? Refer to Leawo Prof. DRM. Leawo’s Prof. DRM is a professional Spotify song downloader program to help you remove the DRM protection upon Spotify songs and playlist, and then download and convert Spotify music to MP3, AAC, M4A, etc., so that you could add the downloaded Spotify songs to Google Home connected devices for unlimited playback. 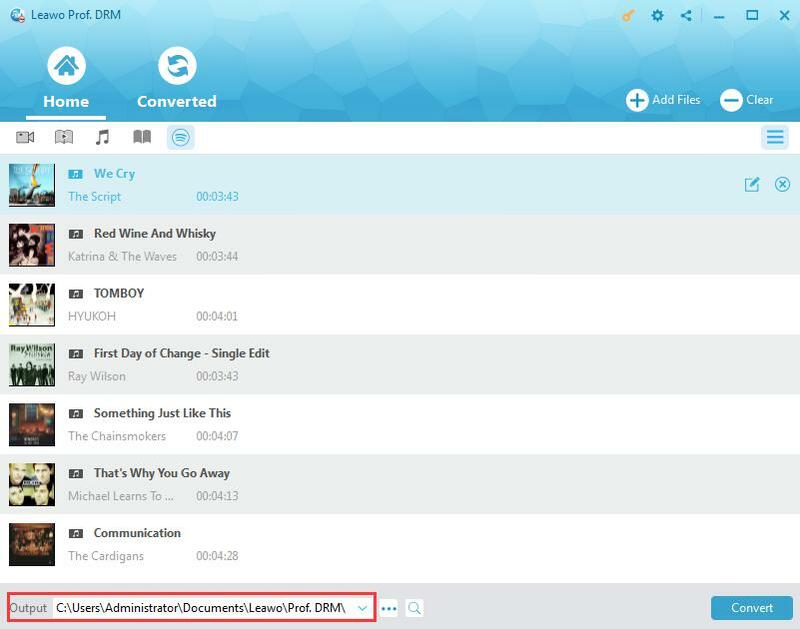 Leawo Prof. DRM even allows you to adjust audio channel, bit rate, and sample rate of Spotify songs before downloading and converting within this Spotify music downloader. Download and install Leawo Prof. DRM on your computer. The below guide would show you how to download Spotify songs for Google Home devices. 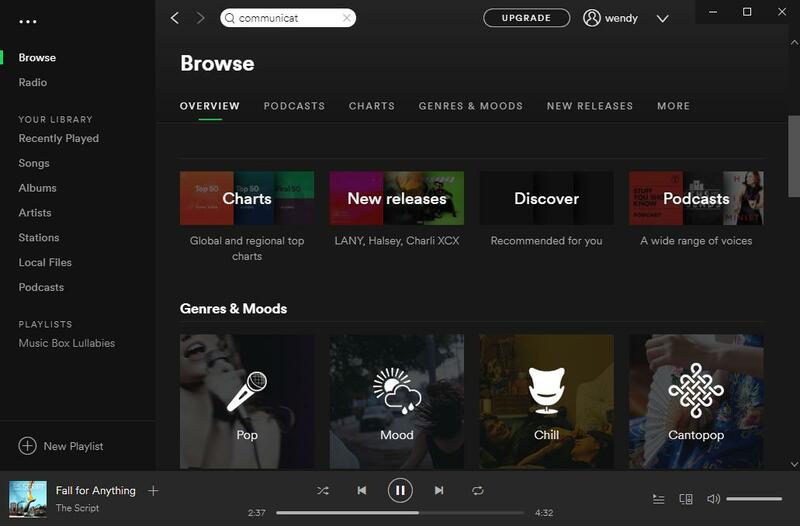 Note: Launch Spotify and play Spotify songs smoothly on your computer to make sure Spotify works normally before you start to download Spotify songs with Leawo Prof. DRM. Launch Leawo Prof. DRM. Launch Spotify desktop app if it doesn’t require you to launch Spotify. 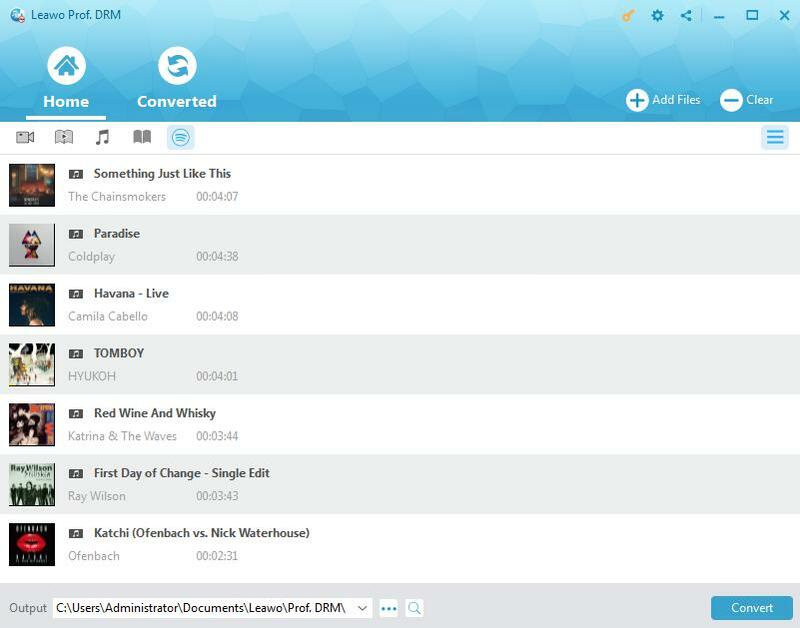 You can directly drag and drop your favorite songs one by one or drag and drop the album/playlist at one time for adding. To add Spotify music playlist to Leawo Prof. DRM, you need to firstly click the Spotify icon on the Converted tab of Leawo Prof. DRM, and then directly copy and paste the playlist URL of your Spotify music playlist into the browser bar. And then click the “OK” button. Then click the pencil icon in each loaded Spotify music title to set output format and audio parameters. Select audio format according to your target Google Home connected device. Click either “Apply to All” or “Apply to current” button to save these settings. Then, move mouse to the bottom and then set output directory in the “Output” box. 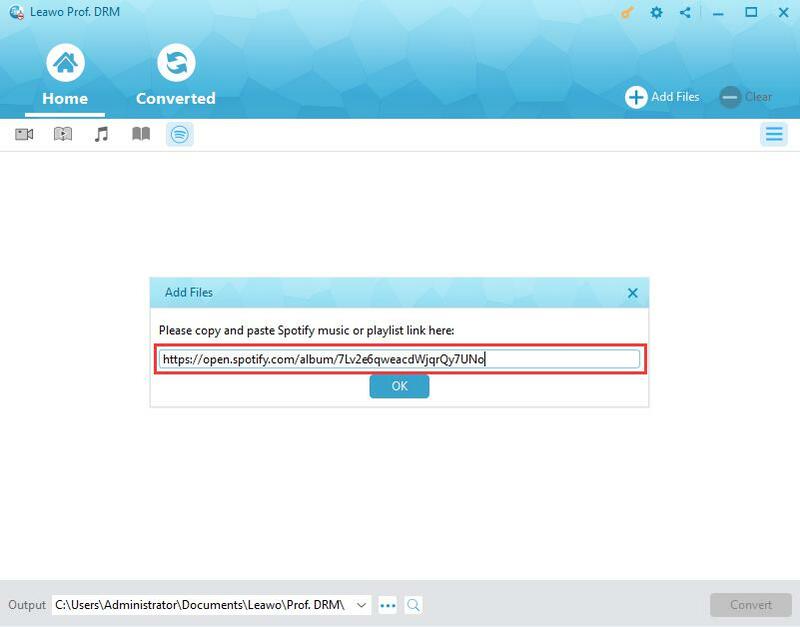 Press the blue button “Convert” at the bottom right corner to start to download and convert Spotify music to DRM-free audio files. After downloading, you could view all downloaded Spotify songs under the “Converted” tab. 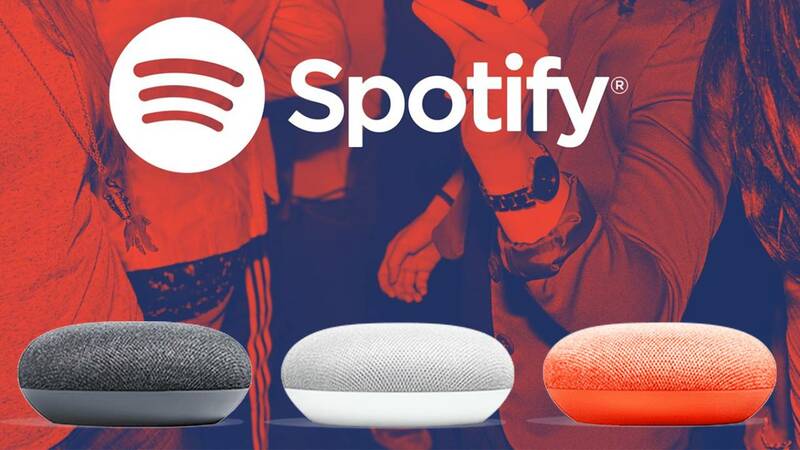 You could then transfer downloaded Spotify music to iOS device or Android via iTunes or iOS data transfer tool, or directly copy and paste downloaded Spotify songs to Android devices that have been connected with your Google Home speakers. The below content would show you a detailed comparison between link Spotify to Google Home and Leawo Prof. DRM for playing Spotify songs on Google Home. Yes. Need to upgrade to Premium version to listen to songs on demand. Yes. Don’t need to upgrade to Premium version for listening to songs on demand. Yes. 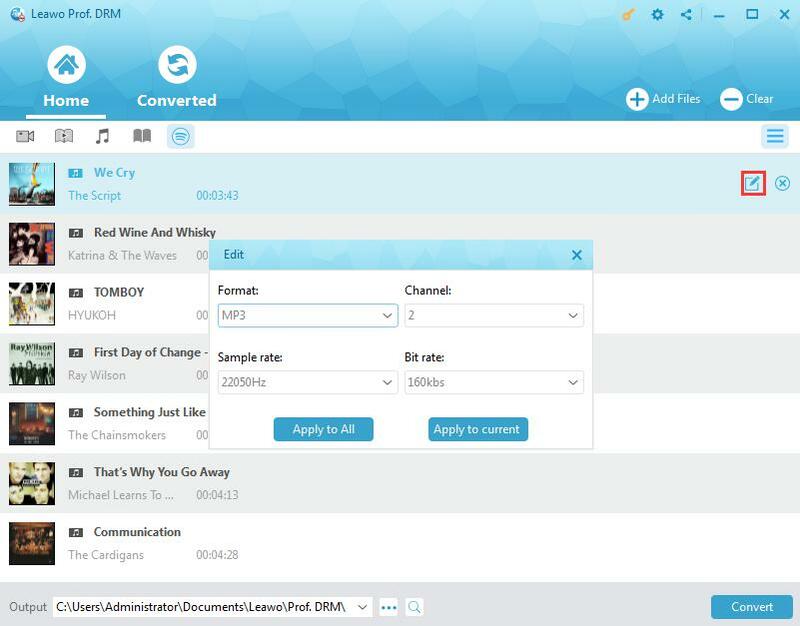 Convert Spotify songs to MP3, WAV, AAC, FLAC, etc. It will be very convenient for you to play and listen to Spotify songs on Google Home via linking Spotify to Google Home, but it will cost you $9.99 per month. 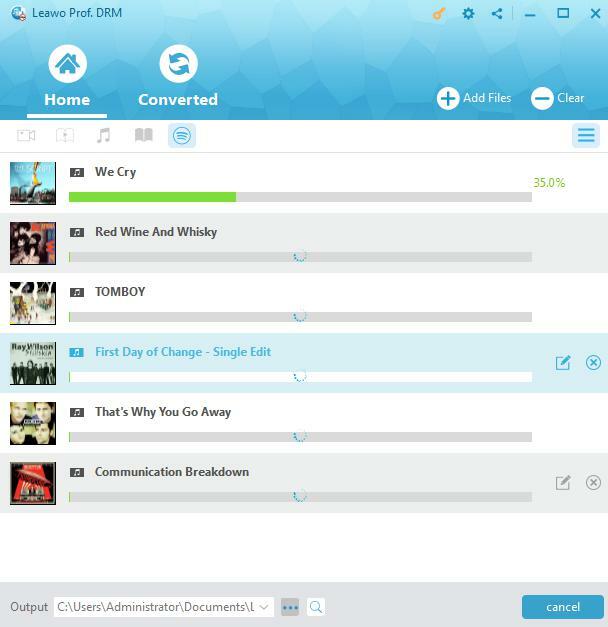 However, with Leawo Prof. DRM, you could freely download Spotify songs to MP3, AAC, WAV, etc. for unlimited uses, not only for Google Home.